Home / About Di Biase / Protect your hair against winter weather! 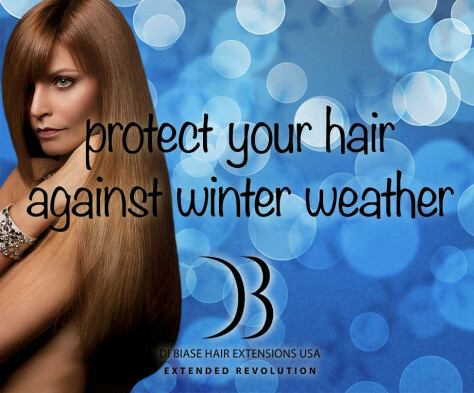 Protect your hair against winter weather! Winter is a beautiful season that usually brings enjoyable images of white fluffy snow and hot chocolate to mind. On the other side, with winter also comes chapped lips, chapped hands, static cling and dried out everything, including your hair. This list provides useful tips from Vikki Parman of Di Biase Hair Extensions USA to help prevent damage to your hair, whether it be your own hair or your professional salon hair extensions. While hair designers often take many of these basic professional practices for granted, it is extremely important to visit with your hair designer for a consultation about proper winter haircare. Though Tempting, Avoid Bringing The Heat: It will be very tempting during the coldest months of the year to take a very hot shower. This should be avoided. Washing your hair in high temperatures will be very damaging. It is best to wash your hair in more moderate temperatures. Do Not Over Wash: Washing your hair everyday may seem like a good idea, yet doing so actually strips the natural oils from your scalp and hair. If daily washing is necessary, use the mildest professional shampoo possible, while also using a complete haircare regimen specifically prescribed for your hair type and hair extensions. Avoid Overheating: When styling your hair with hot tools, it is best to not use a high temperature setting. Use your haircare appliances with professional products that contain thermal barriers within them to protect your hair from the heat. Hot tools may sizzle some of the moisture out of your hair and dry it out. Hairstyling this way should not be done daily to prevent hair from becoming frizzy, dry and brittle. Safe & Secure Hair: Sometimes it is necessary to secure your hair back with bobby pins or with an elastic hair tie. When using a hair tie, it is best to use ones that have no metal components, because they may further damage hair that is even slightly affected by the winter weather. Conditioner Treatments: A professional salon hair conditioning treatment regimen will be essential in the winter. Instant leave-in conditioners will help keep your frizz down. It will also restore moisture throughout the day, while a regular conditioner can be used during showers and as a treatment. Weekly deep conditioning treatments are especially important during this time of year, no matter what hair type you have. Don’t forget to ask your hairdresser how to maintain a healthy scalp. Your scalp may become irritated by dry winter weather. Avoid dry flaky scalps by getting hydrating and stimulating salon scalp treatments. This is the perfect time for to ask your salon professional about a customized conditioning treatment that will be perfect for you, your hairstyle and lifestyle. Outdoor Protection: Covering your hair while outside in the elements is very important to help retain moisture in your hair. This also will help to keep down unwanted frizz and static. Wrapping your hair in a scarf, covering it in a hat or hood are all good ideas when outside. Coverings made with silk or satin linings are better for your hair, because they will not absorb moisture and rub the hair together causing damage like wool, cotton or many other fibers can. Ask your salon for recommendations for the best fashionable scarves and hats to protect your hair. Don’t Go Outside With Wet Hair: You may not catch pneumonia when going outside with wet hair, yet you must know that the challenging winter elements may still damage your hair. Your hair could freeze, when going outside with damp hair in freezing weather. Water expands when frozen. If your hair has absorbed the moisture, then it will be damaged. In the winter, you will always need to dry your hair thoroughly, before going outside. Ask your hair designer to recommend a protein-rich moisturizing shampoo and conditioner with an extra leave-in conditioner that you can apply before using a blow-dryer on your hair at home between salon visits. Compatible Hairstyling: If you live in an area that gets cold enough during the winter that you will need to wear a hat most of the time, then very full voluminous curls may not always be the best hairstyle for the season. Ask your salon professional to recommend a hairstyle that will be compatible with your winter needs to ensure that you will have easier haircare maintenance and less frustrating hair days. Don’t Leave Home Without It: There are some items that are a good idea for you to have at all times during the winter season. A small bottle of leave-in conditioner and a small bottle of hairspray should be in your purse. Besides static from winter wear, your hair may build up a static charge during the winter months just from walking across a carpet. Keeping that small can of professional hairspray on-hand will help in times when you notice the static building. Hairspray will negate the static charge and will help keep your hair smooth and tame even in the most shocking situations. Timely Trims: Since the winter may leave your hair breaking and splitting, it is very important to have regular haircuts to keep your hair at it healthiest. During the winter months, most women are more likely to use blow-dryers and hot tools without the protective thermal barrier products, which may cause more breakage. During the winter, you should get a haircut no less than every 6 to 8 weeks in order to keep your hair looking stylish, healthy and clean. Join The Extended Revolution! Ask your professional hair designer for a hair extensions consultation, to explore the many creative options available to you today. Di Biase Hair Extensions USA are used by many salons, as well as by many Hollywood celebrities. For more information on Di Biase Hair Extensions USA and to find an affiliated salon with certified hair extensionists near you, call 248-885-4748 and email: Info@DiBiaseHairUSA.com. Visit: www.DiBiaseHairUSA.com.